2013 Arnot-Roberts, Trousseau, North Coast. Seriously, this is one of the most sought after wines in the state, yes, it is, a pale, light bodied red that just has enough color to make you believe it is not a rose, but it is ultra cool and Duncan Meyers can’t get get enough Trousseau Noir grapes to satisfy his Arnot-Roberts fans for this unique Jura style red. The 2013 Arnot-Roberts Trousseau (Noir) comes from two locations, from the original plots in Lake County and now from some new sites in the Sonoma Coast area, that is why the label now reads North Coast wine. Only a tiny amount of this wine ever makes the shelves, but in case you do see it, you should grab all you can, it is bright, lifting, spicy and delicate, a wonderful expression of this varietal and very delicious. 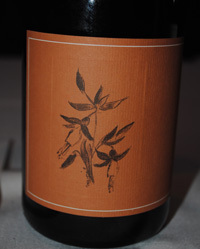 In fact all the new and up coming releases from Duncan Meyers and Arnot-Roberts are wonderful wines, a couple worth mentioning are the two new Santa Cruz mountains Pinot Noirs, the new Trout Gulch Chardonnay, also from the Santa Cruz Mountains and farmed by Richard Alfaro, who has also sold some of his estate Gruner Veltliner to the Arnot-Roberts boys in 2014, plus the new North Coast Syrah, so be sure to keep your eyes pealed for the 2013 vintage Arnot-Roberts, these are beautiful California wines. Duncan has made a set of flavorful, vibrant wines all coming in around 12 to 13% alcohol, and all show beautiful detail and a talented artisan touch. Back to the lively and exotic Trousseau Noir, it starts with fresh picked strawberry, cherry and light plum fruits, a hint of floral tone, wilted rose petals, and earthy spices, fennel, plus with wet and dusty stones, peppercorns and with herbal notes, tangy red currants and a touch of cedar on the finish. This smooth and crisp red lingers gracefully on the finish and is softly fruity with saline and savory elements throughout, this is really fun wine, you can see why it is so popular and a total wine geek wine, drink from 2015 to 2018. 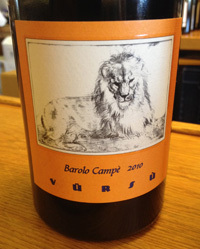 Barolo Vintage 2010 “The King of Wines Strikes Back” in Pure 100% Nebbiolo Vision! Hailed by everyone, Wine Spectator, Robert Parker, Antonio Galloni, most all the major papers and wine press as the vintage of our generation the 2010 Barolo wines have a lot to live up to as the reach the store selves and wine lists across America and the world. Barolo, the King of Wines, as it called, and for good reason, it is one of the top wines of Italy and it is made from exclusively Priedmonte’s classic grape Nebbiolo, the little one of the fog, is shared among many areas such as Barbaresco, Gattinara, Ghemme and of course the most famous Barolo near the historic hamlet of Alba and with some of the most wonderful vineyards in the world like Cannubi, Bussia, Ginestra and Falletto, plus many, many more, this is a great terroir with clay, sand and limestone soils given immense drive an energy to the best wines. The winemaking ranges from modern to rustic, but it is the traditional and old school wines that seem to come away the best here, and while small French oak barrels can be and are used here, the results don’t always offer up the best wines, in many cases it is the huge old Slovenian casks the perform the best. Nebbiolo, like Pinot Noir is not overly dark and it gets a bricky tint around the edges, but it’s flavors are complex and unique, this in my opinion Italy’s most noble of grapes, loaded with high acidity and tannin, even though I love many others it is hard to deny this basic truth. I will say, given the expectations, these are most truly wines you will want to own, though you will need the patience of a saint to really be rewarded by these amazing wines, my best analogy is like watching your child being born and instantly knowing he will grow up to be the president, you can see the future, you can feel it inside, but you will have to wait for it to happen, that is the glory and the frustration, the 2010 Barolo offering, especially the serious ones are powerfully tannic and bursting with extract, while beautifully balanced, they are just getting started in life, there are many complexities to develop and textures to gain. I decanted and forced a selection of these 2010’s reveal themselves, and here below are my notes and reviews, plus a few others that have been presented to me recently. In all critical honesty, this is a vintage to own, horde and keep, if you have a cellar, you must start grabbing these Baroli, when you compare the great blue chip wines of the world, Bordeaux and Burgundy especially, the price is sky high, but these wines while never cheap are stunning values for such collectable sure bets. From my own notes and from trade tastings, the 2010 Barolo vintage wines, most notably the Crus are as elegant and dense as Grand Cru Burgundy with lifting acidity, detail and poise, and these wines have force, impact and charisma in the first growth league, I admit to being an Italian wine fan and was really looking forward to these wines, but they still surpassed all my dreams and preconceived notions they remind me of the 1996 and 2000 vintage Baroli and similar to 2001 and 2004, but much more stylish and without question better, regardless of the hype is is good to see the King back in his rightful place among the great wines of the world, long live the King. Be sure to keep your eyes open for stellar producers that have yet to release 2010 wines, like Bruno Giacosa, Gaja Sperss, Cerretto, Manzoni, Giovanni Rosso, Roberto Voerzio, G.D. Vajra and Bartolo Mascarello just to name a few! You will not want to miss these…. Hopeful I’ll get to review them! 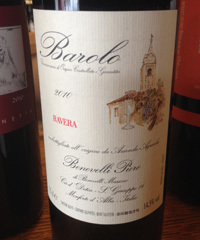 2010 Piero Benevelli, Barolo “Ravera” DOCG, Piedmonte, Italy. Benevelli, imported by Kermit Lynch, who started his career out in the early 1970s importing some of Burgundy’s most famous producers, is now discovering northern Italy and venerable Barolo producers like Benevelli. The 2010 Pero Benevelli Barolo is from southeastern-facing hillside cru of “Ravera” located deep in the southeast corner of the Barolo commune zone. According to Kermit Lynch, “The wines from Ravera have the distinction of combining the structural strength of neighboring Serralunga d’Alba with the concentration and richness of Bussia and the other crus further north.” I might agree, but I also find the Benevelli Ravera one of the most fruity and approachable of the seriously made Barolo 2010’s I have tried so far, and this is certainly a great staring out Barolo for the new wine enthusiast to understand fine Nebbiolo, and Barolo itself. The Benevelli starts with anise and balsamic notes and quickly offers up raspberry, cherry and plum fruits along with strawberry jam, game, wild mushrooms and minty herbs finishing with soft tannins, cedar, nutmeg and lingering currant. Drink from 2015 to 2020, this is a super nice Nebbiolo and a fine value. Tasted twice. 2010 Brovia, Barolo DOCG, Piedmonte, Italy. The 2010 vintage is looking epic, these are Barolo wines that might only come around two or three times a generation and there are some amazing wines just hitting the market that you should really jump on, and this regular Barolo from Brovia is for sure a top choice for quality and value. Brovias Cru Baroli are going to be legendary and spectacular, but this “normale” Barolo is fantastic, and it is a blended cuvee of their top Cru sites. Brovia from Castiglione Falletto is one of the great traditional new generation producers, a winery that uses old school techniques, but with intense attention to farming and every detail, I have become a huge fan of these wines over the last five years since being introduced to them. They are considered the Burgundy of Barolo, and in the 2007, 2008 and now in 2010 vintages, you can see why, these are beautifully crafted wines that gives pure Nebbiolo character, but are done in an elegant, poised and restrained fashion. 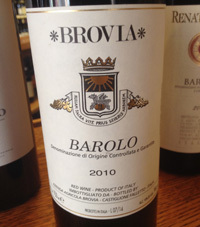 The 2010 Barolo by Brovia is seductive from start to finish, leading with sweet and savory herbs, multi floral bouquet with incense, rose petal and mineral tones. The palate is vigorous with damson plum, cherry, balsamic dipped strawberry, red currant and black licorice flowing along with gravelly stones, saline, bitter herbs, tea spice, tar and truffle adding nice cut and counterpoints to the fruit, there is some fine grained tannins, as you’d expect from a young Barolo, but it doesn’t get in the way of massive appealing pleasure found in this classy Nebbiolo. There are added complex components to be found to, with cedar, mint, game and kirsch finding there way into the pretty layers that unfold in the mouth, this wine has good density and stunning length, it most certainly will age gloriously and drink well into the next decade and more, while it will be hard to wait too long on this Barolo, it should be advised to hold on for another couple of years before exploring it’s many exceptional facets, drink from 2016 to 2026. Be sure to look for these Brovia 2010 Barolos, and for great everyday stuff check out their fabulous Barbera too! Tasted twice, better each time. 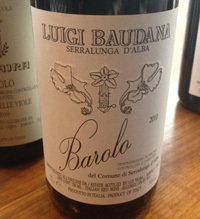 2010 Luigi Baudana, Barolo DOCG, del Comune di Serralunga d’ Alba, Piedmonte, Italy. Giuseppe Vajra’s lovely and precise normal Barolo from his Luigi Baudana label is maybe the steal of the vintage so far, it is wonderfully classic and full of flavor with an array of layers and superb structure, it shows fine tannins and nice acidity, neither of which intrudes on the generous fruit. The 2010 vintage is one of the most hailed years for Barolo I can remember, and after tasting the Vajra and Baudana I can certainly see why, and agree, this is a fantastic vintage and these wines have massive potential, even though you’ll need to wait some years to get all that is promised, these wines will be very rewarding and they deserve a place in your cellars. The regular Baudana crafted lovingly by Giuseppe Vajra is really a seductive and pretty wine with hints of roses and wild flowers, minty tar, bacon and lifted red fruits including plum, cherry and bramble berry along with anise, spice, loam and truffle notes plus a lingering finish of tangy currants and cedar. This wine shows a delicacy and poise already and there is much more to come, be sure to keep an eye out for the Luigi Baudana 2010 Barolo, it should arrive in the States late fall of this year (2014) and should drink wonderfully for the next decade easy, best from 2016 to 2021. 2010 La Spinetta, Campe Della Spinetta, Barolo “Campe” Vursu DOCG, Piedmonte, Italy. The 2010 Campe Barolo from Giorgio Rivetti is a classic, but it is a powerful and forceful young Nebbiolo that will need plenty of time to shed it’s tannins, even though there is loads of character and charm waiting underneath. La Spinetta’s Campe is a lion in lion’s clothing, and certainly this vintage remains true to form with lots of savory/meaty elements and gripping tannins, hints of bright/minty herbs and spiced plum showing now. There are hints of floral notes on the nose, rose petals and smoky incense leading to cherry, red currant, cured ham, bacon fat, truffle and walnut/cedar along with mineral tones, anise and a touch of vanilla. These 2010’s have structure with lifting acidity and firm tannin, but there is an elegance hiding behind and the tannins are refined and should allow beauty to shine through in a few years. La Spinetta’s Campe Barolo is a very serious and in my opinion a blue chip Barolo, I have enjoyed many bottle, and I had the very first Campe, the 2000 vintage prior to it’s introduction, on one of Giorgio’s west coast swings, back in the day, and recently Campe 2000 came out on top of a blind tasting in Barolo with Gaja, Giacosa and other top producers in the lineup at the time, so while La Spinetta is well respected fro their gorgeous Cru Barbaresco, much deserved, the Barolo Campe and Barolo Vigneto Garretti are very worthy wines, and this is the vintage to discover and collect! cherish this super Nebbiolo from 2018 to 2028. Tenth anniversary Campe, and it’s a brilliant Barolo, bravo Giorgio! 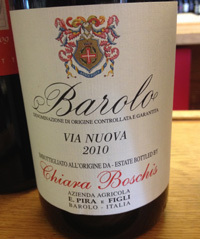 2010 E. Pira-Chiara Boschis, Barolo “Via Nuova” DOCG, Piedmonte, Italy. The queen of Cannubi, Chiara Boschis has made a glorious and hedonistic in 2010 with this Via Nuova offering blended from 6 Cru sites, that should be hitting the shelves as we speak, and if you like her wines you’ll want to chase this beauty down ASAP! The vintage of course is being hyped like crazy for Barolo, and while you can still get fine 2008 and plush 2009’s around, it will be a smart investment to grab these 2010’s, from what I’ve tasted the rumors are true, this is a fantastic year for Nebbiolo from Piedmonte, with Barolo in particular showing everything you’d ever want, period. This 2010 E. Pira-Chiara Boschis starts with tannic kick, but quickly unfolds pretty details with a bouquet of rose oil, lavender and dried violets along with earthy notes, amaro/herbal elements leading to a firm palate of baked cherry, damson plum, raspberry and strawberry fruits, balsamic/hoisin, truffle, savory meat and tar, plus a kick of black licorice and cedary wood. This wine is wonderfully proportioned and artfully crafted, even at this tight stage, potential rewards can easily be seen here, better to have patience, but a great wine is always a great wine. I am very impressed and smitten with the Boschis, it should deliver pleasure for another decade with ease, best from 2017 to 2026. 2010 Luigi Pira Barolo “Vigne Margheria” DOCG, Piedmonte, Italy. 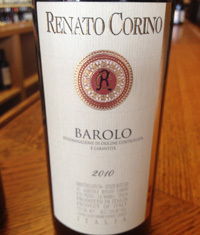 2010 Renato Corino, Barolo DOCG, Piedmonte, Italy. From La Morra and exotic, Renato Corino’s Barolo comes in at a whopping 15% alcohol and is an open knit wine that will not require as much aging to be ready to drink, in fact, you’d might even want to start drinking this bold effort early. The Renato Corino wines are always well priced for a top grower in Barolo and the 2010 is a generous and robust offering with bold notes of blackberry liqueur, morello cherry, red licorice, cured meats and mint-infused finish. While not your dad’s or grandpa’s Barolo, this is impressive young Barolo with true, though ripe, Nebbiolo character that is a crowd pleaser. The 2010 shows refined, mute and smooth tannins, a burst of acidity and juicy layers that come on in density worthy of a much more expensive wine. I must confess, it was a confusing Barolo when compared to a few of the more austere style bottling opened along side, but it held it’s own and was a nice contrast, if not my personal favorite, it is very serious juice and again a super value. There is plenty of flamboyant flavors to keep you interested for a few years, drink from 2015 to 2018. 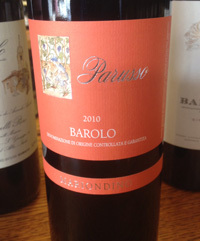 2010 Parusso Barolo “Mariondino” DOCG, Piedmonte, Italy. This is another very shy wine, and it has a firm chalky and chewy tannic bitterness that hides the fruit, it also showed very different from bottle to bottle, and one bottle, not corked, was almost undrinkable and hard, but another was perfectly acceptable, though severe in style, regardless I have hope that more pleasure will come in time. To be fair, I think this wine has begun to shut down and should come back to life in a few years. I seem to catch these highly rated Parusso offerings at exactly the wrong time, as this wine was pretty clearly in a deep sleep. This is another Barolo that gets a lot of attention and mid nineties scores from notable critics, and while I’ve had them since the late 90’s and even sold many a bottle over the years, this is a producer I just don’t seem to get or enjoy when in my own glass, even if I have respect for and am sure it has many a loyal fan. There is clearly complexity here, in the better bottles I tried there was all the correct elements and depth to be a super Barolo and it does have classic Nebbiolo qualities. Showing bright cherry, racy acidity, driving tannins and brambly fruits. There is loamy earth and tar along with black cherry, plum and raspberry that form the core in Parusso’s Mariondino, as well as savory meats, soft woody notes and tea spices, best to give this a little time to fully form, drink from 2018-2026. 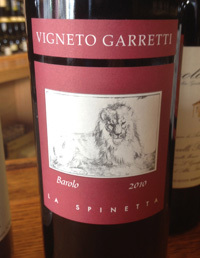 2010 La Spinetta, Barolo “Vigneto Garretti” DOCG, Piedmonte, Italy. La Spinetta’s Garretti comes from the bottom portion of the calcareous-rich Campe site/vineyard at approximately 600 feet above sea level. 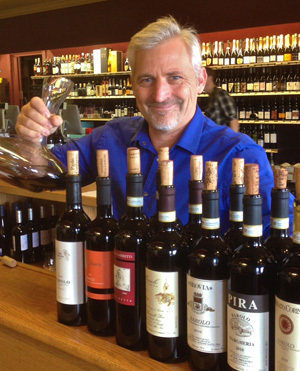 The house style here has been called modern or ultra clean, but owner/winemaker Giorgio Rivetti is a minimalist at heart, choosing not to filter or fine his wines as well as moving towards biodynamics in his vineyards. This is an example of a fuller, broader, fleshier Barolo that is aged in medium toasted French oak for 20 months before going to bottle for another year, and that said it is not over the top oaky or ripe. Sweet smoke, earth, graphite along with seductive aromas of red violets and fennel grace the nose and are followed on the palate by black/damson plum, robust notes of black fig, sweet and sour cherry, licorice, incense or flavored tobacco leaf and tea, leather and vanilla. This “baby” or little brother to Campe is showing well, it is also showing a real savory and meaty side right now, best to let rest a few years, drink 2016 to 2020. 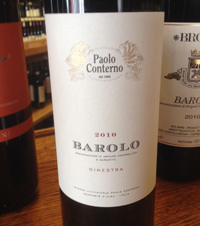 2010 Paolo Conterno, Barolo “Ginestra” DOCG, Piedmonte, Italy. The 2010 Barolo Ginestra has magical potential and while very intriguing now, the rewards of patience could be spellbinding, this could end up a hall of famed! This wine has wow factor with elegant mineral tones, deep and dense fruit, glorious structured and lengthy on the finish, all the while showing youth and power in spades, the wait will be worth it, no question. Ginestra is unique and is a great site, it could be one of the best in all of Barolo, and Paolo Conterno’s 2010 Ginestra is lovely stuff indeed with a haunting finish, I’m so glad this wine was last in my flight, it stayed with me forever and cemented my pure joy and belief in this remarkable vintage. The Conterno Ginestra is certainly a wine made and born in the vineyard and it has a real terroir driven personality with black raspberry, spiced plum, mineral, red cherry, clove/pepper spice, mint tea and licorice along with cedar, tar, bacon and liqueur notes with lingering wilted roses, dark violets and a savory truffle/earth note. This is going to be a rockstar, and an opera diva melded into one, drink from 2017 to 2025, no question the Ginestra will be a dream come true in a few years! 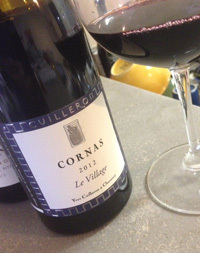 2012 Yves Cuilleron, Cornas “Le Village” Rhone Red, France. This young Cornas, 100% Syrah, is deliciously fresh and alive already and can be enjoyed even now, though I expect it to age with poise and grace for another decade. I found the new Cuilleron Cornas Village to be a wonderful wine, full of flavor and vibrancy, it certainly is not nervy, or tannic, though it also lacks a bit of the stemmy intensity like the some of the other latest Cornas releases, like the wines from Gilles, Clape and or Allemand. That said, it is not a clone of what is trendy and is perfectly crafted to reflect terroir and old world charm, as well as being a super drinkable Syrah with spice, layered fruit and earth/mineral elements, I can highly recommend all of Cuilleron’s wines, especially this one, they are pure and easy to love. The 2012 Cuilleron Cornas Le Village after 18 months in barrel, and coming in at 12.5% alcohol, starts with a bouquet of meaty earth, violets, minty herbs and red fruits, leading to a palate that turns dark, to match the blue/black and purple hue with blackberry, blueberry, boysenberry, currants and plum all coming out along with bacon, pepper, cayenne, lavender, cinnamon and melted licorice finishing with hints of cedar, truffle and mission fig. This supple, refined and savvy Syrah is between medium and full bodied and shows restraint, lift and folds together remarkable well, it should be a super wine over the 3 to 5 year period gaining in depth and complexity, even though it can go longer still, drink from 2016 to 2019. 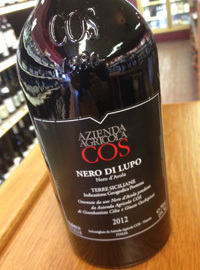 2012 COS “Nero di Lupo” Nero d’Avola, Terre Siciliane IGP Rosso, Vittoria, Sicily, Italy. COS-Cilia, Occhipinti and Strano was formed by three friends, Giambattista (Titta) Cilia, Giusto Occhipinti and Cirino (Rino) Strano, winemaking visionaries that wanted to explore making wine of their ancestors and using biodynamic farming in the vineyards. Their project started in the early eighties, but everything as we know it changed in 2000 with the full adoption of biodynamics and the use of amphoras, like the ancient Greeks used to raise, age and transport wine. In recent times this practice has been gaining traction, but it was pretty revolutionary when COS committed to it, and now COS is one of the great wines, and estates in Sicily. The winery, with Giusto Occhipinti, who is Arianna Occhipinti’s uncle, making the wines has been very influential in Vittoria and especially in the Cerasuolo di Vittoria region, they make a number of wines from native varietals, especially Frappato and Nero d’Avola. The 2012 COS Nero di Lupo comes from sandy, clay and limestone soils and is fermented and raised in concrete, Giusto Occhipinti uses temperature controlled cement vats to ferment the Nero d’Avola and there is a lengthy period of skin contact, COS does use mostly used (Neutral) wood barrels to age, and this cuvee is not aged in the clay pots. The COS Lupo is delicate and subtle with chalky stone and mineral tones and some earthy meaty elements come through on the background, but the core of this beautiful wine is blackberry, cherry, strawberry and wild plum fruits. The texture is round, but not heavy, fine tannins and bright acidity add firmness and cut and there is complex layers of spice, savory herbs, truffle and anise as well here, this is a lovely example of artisan Nero d’Avola. The medium weight body and stylish and lengthy finish make you think of Burgundy more than new world, this is very much an old world, old school wine from an impressive and talented group that are passionate about nature and their sense of place, drink from 2014 to 2020.